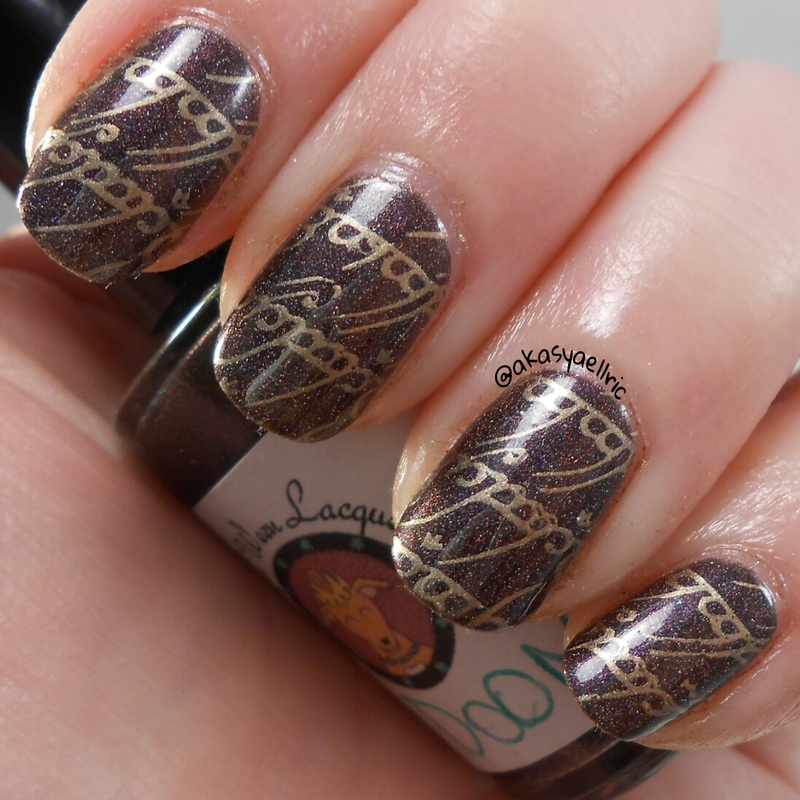 Today I have the recently released Middle Earth Part 1 set from Regal Ween Lacquer. This is a five part set that is inspired by different locations from the Lord of the Rings world. I did stamping inspired by each theme of the polish too! Up first is Minas Tirith. Minas Tirith is a metallic white inspired by the capitol city of Gondor of the same name. It has a subtle shift of color blue, purple, gold or cyan with some scattered holo in the mix. I did brickwork and a castle for the great fort of Minas Tirith. This polish is beautiful. 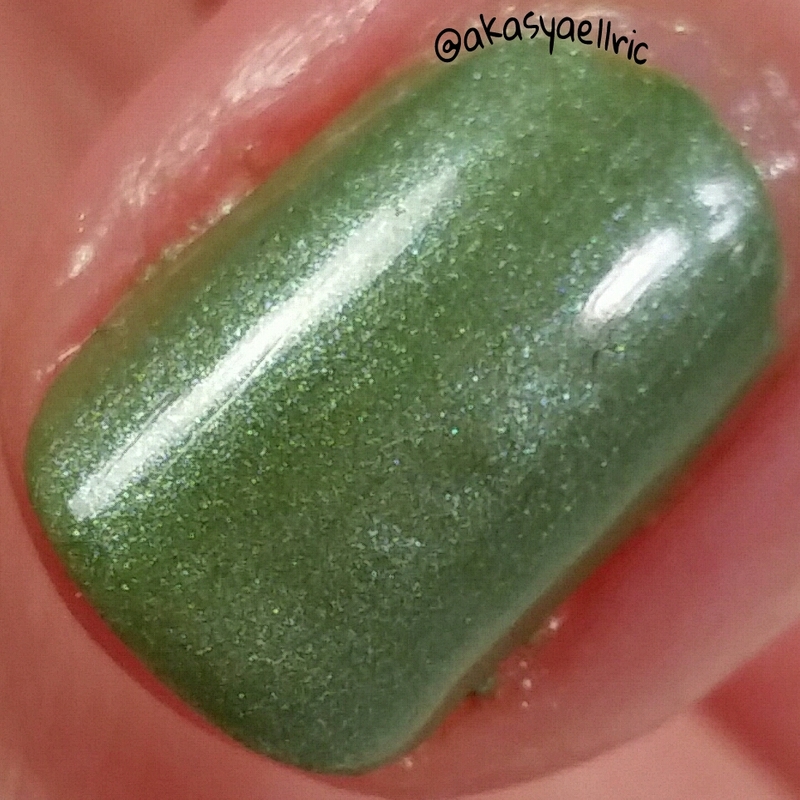 The formula was great, two to three coats for opacity. Dry time was also in par with her other polishes. Products used: Dainty Digits Polish Glitter Be Gone basecoat, Regal Ween Lacquer Minas Tirith, I, A.M CustomColor DiamondPRO topcoat. 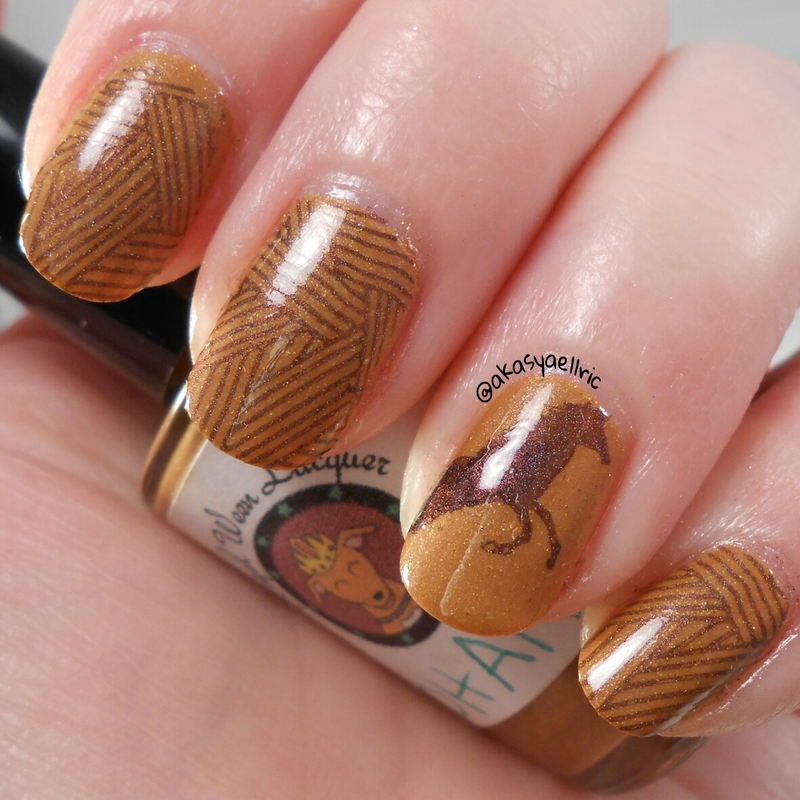 Zoya Ling used for stamping with Moyou London Fairytale Plate 02 and Hehe plate 026. 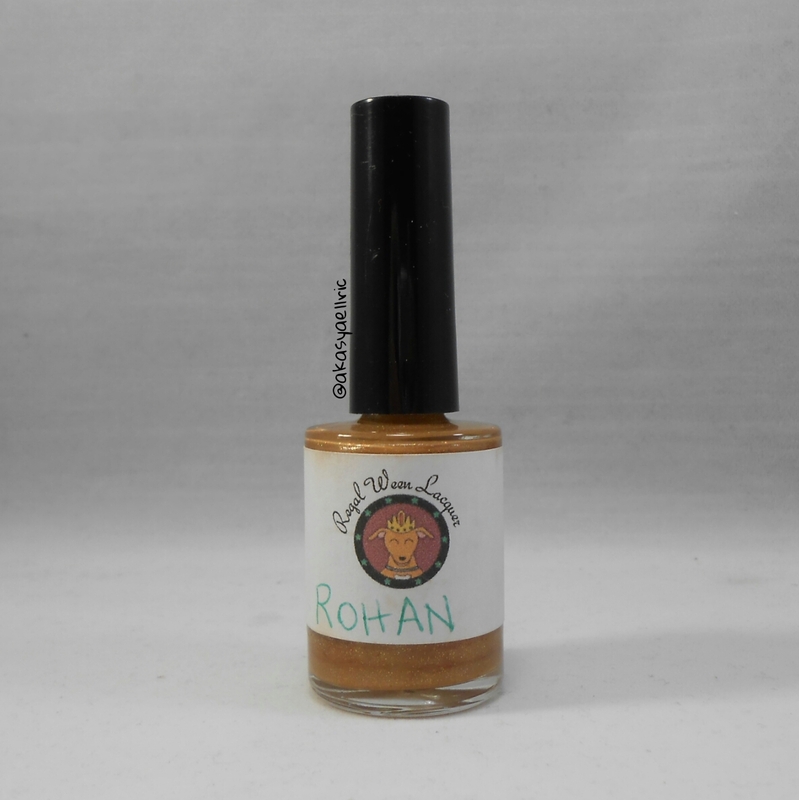 Rohan is inspired by the golden grasses of the fields of this city. 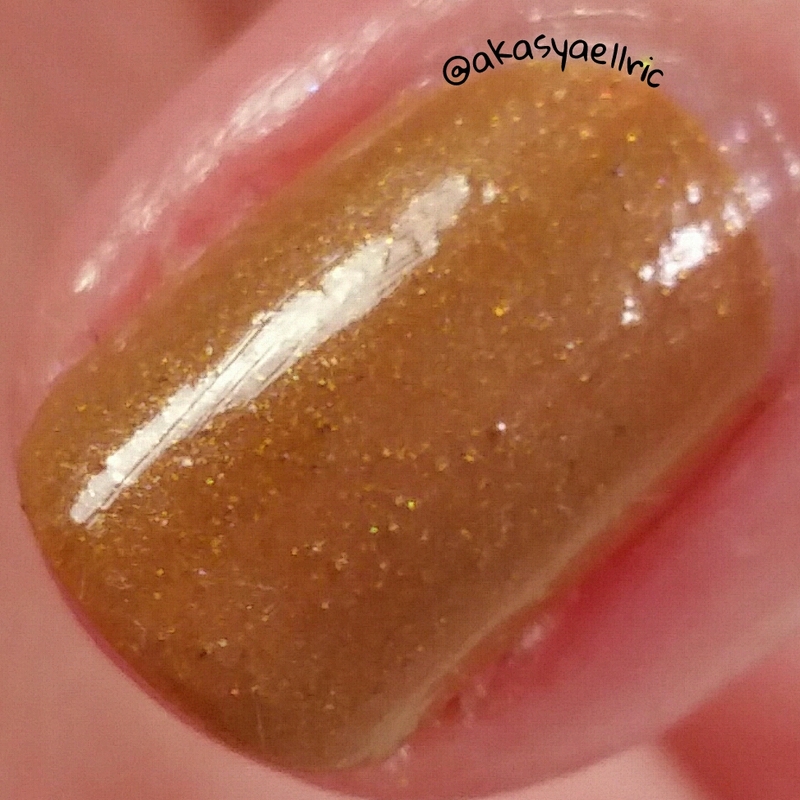 It is a golden brown creme with gold holo dust. 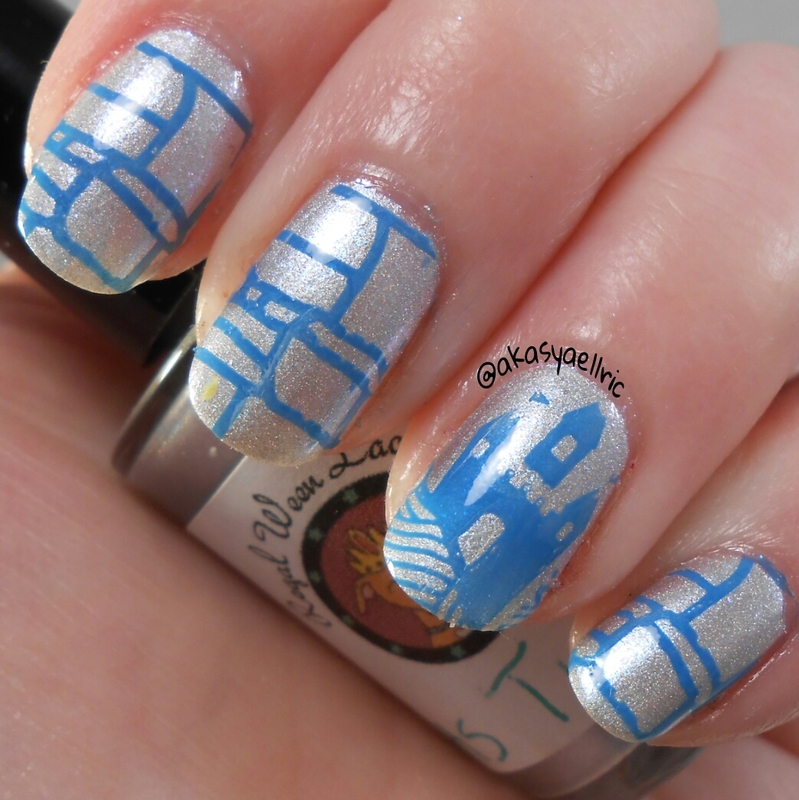 This also can used for stamping, which you will see later. 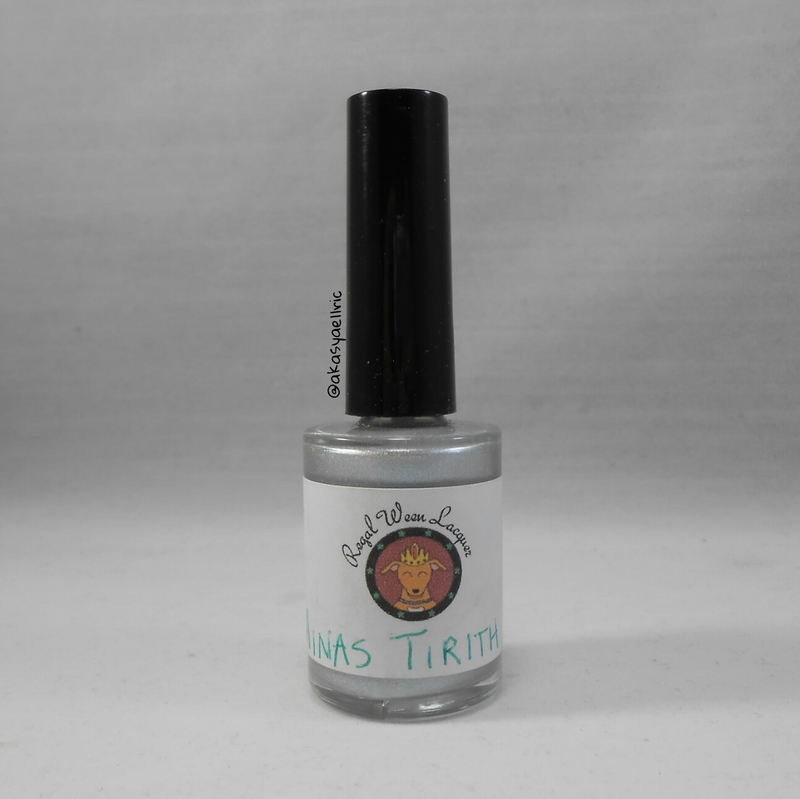 This beautiful, unique, polish is great, two coats for opacity, great formula and dry time. Clean up was easy as well. Products used: Dainty Digits Polish Glitter Be Gone basecoat, Regal Ween Lacquer Rohan, I, A.M CustomColor DiamondPRO topcoat. Ruby White Tips Kurt used for stamping with Moyou London Fairytale Plate 02 and BM-615. 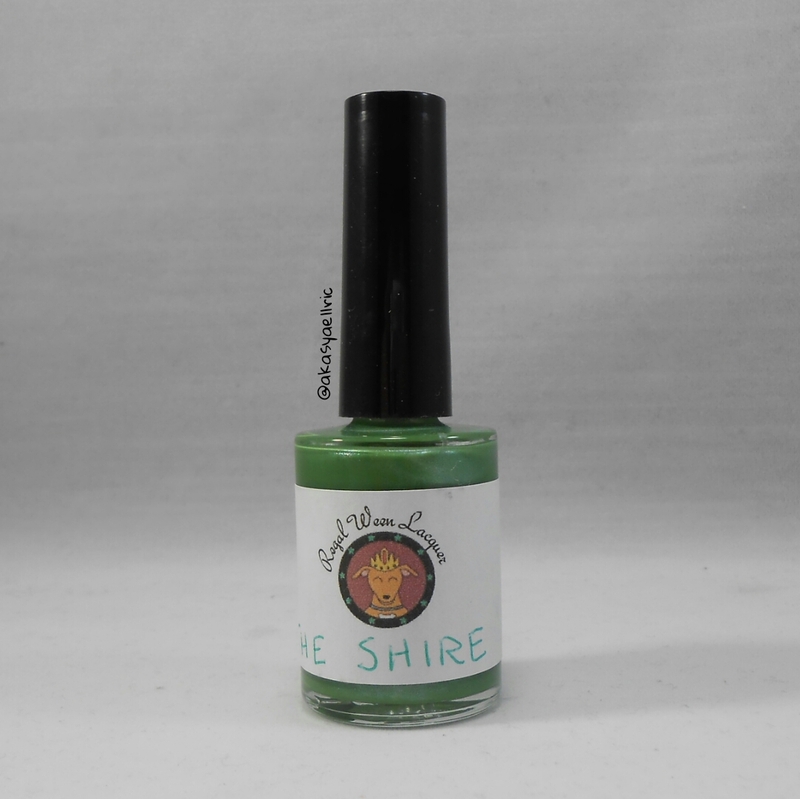 This is The Shire, a vibrant green inspired by Frodo’s home. A shimmering green that can flash gold or purple. I used Rohan for stamping here. I wanted a subtle tree look, but not to overpower the green and it was perfect for the job. It was opaque in two coats, and I feel this one is a stunner. Dry time was great, same with the formula. Products used: Dainty Digits Polish Glitter Be Gone basecoat, Regal Ween Lacquer The Shire, I, A.M CustomColor DiamondPRO topcoat. 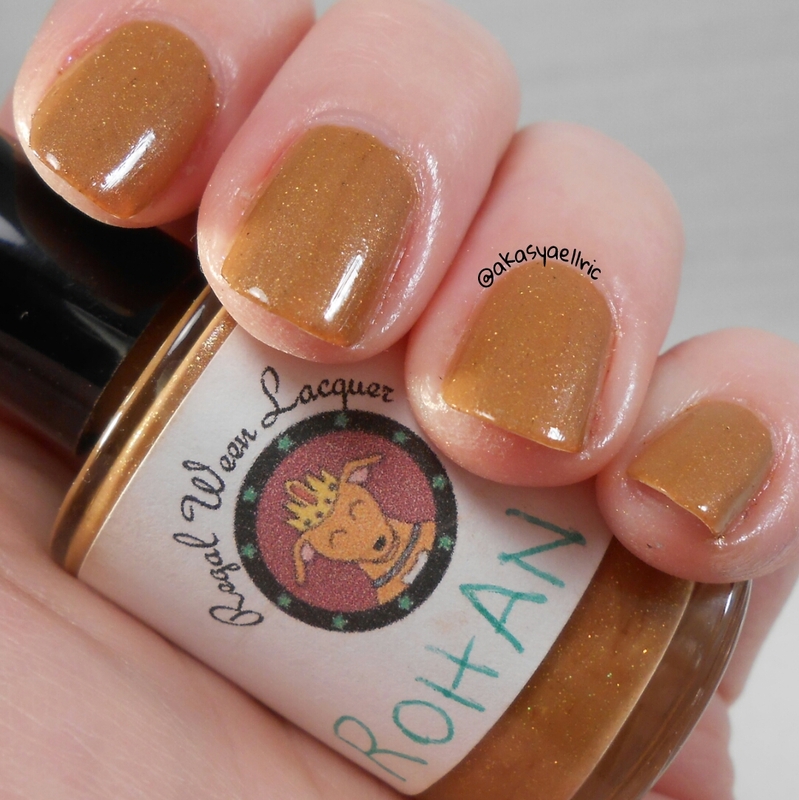 Rohan used for stamping with Moyou London Mother Nature Plate 01. This is Mount Doom, inspired by the burning fires of the mountain and the cold metal armor of Sauron’s army. 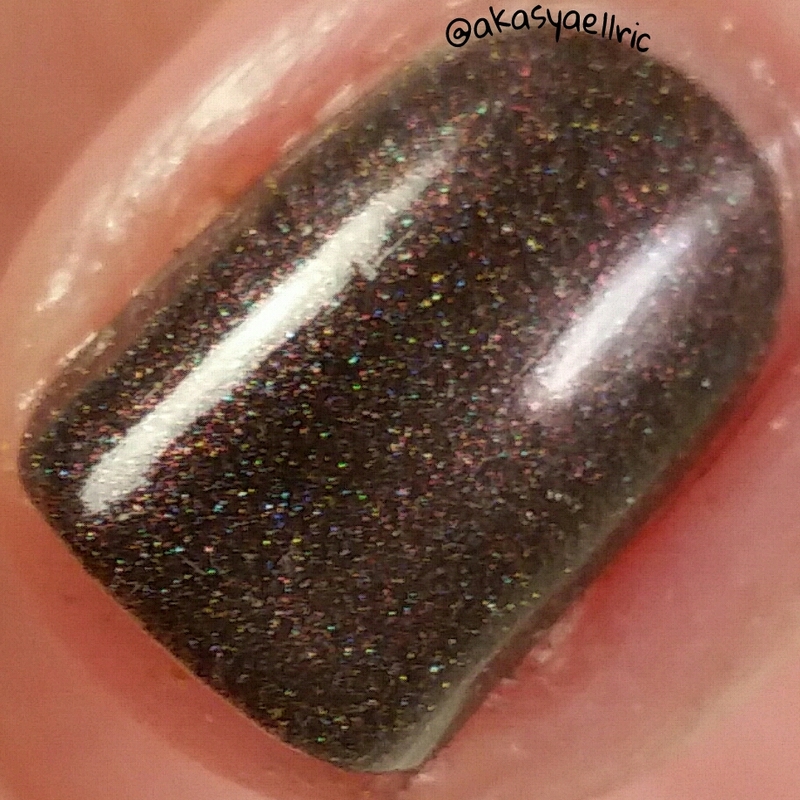 It is a blacked base with red and purple tones and a chameleon shift and scattered holo. This has a lot of depth to it, it like a little mystery in a bottle. I really love this one a lot. Opaque in two coats and great formula and dry time with no smudging. 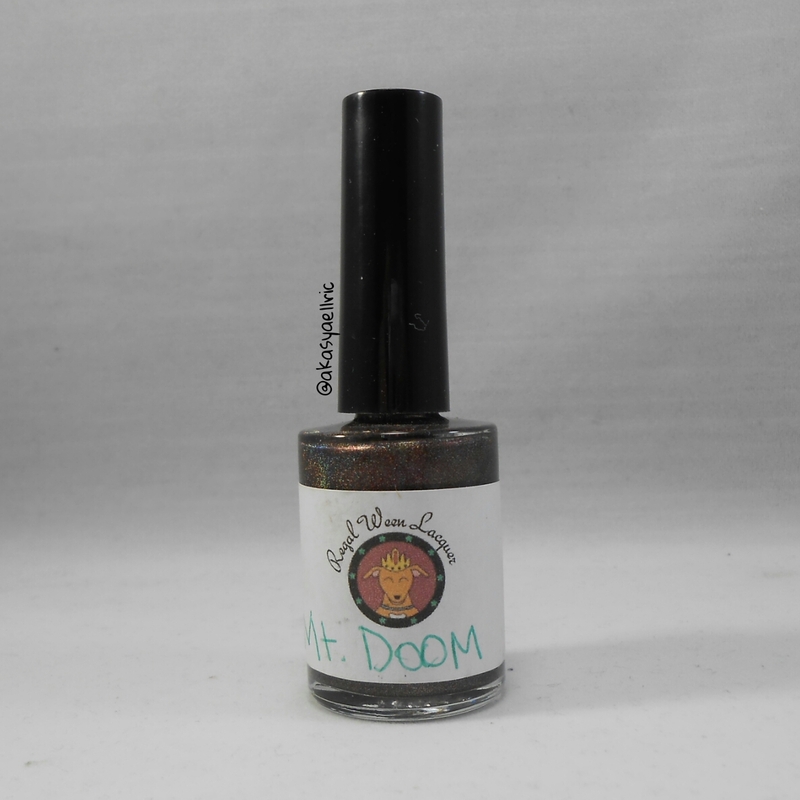 Products used: Dainty Digits Polish Glitter Be Gone basecoat, Regal Ween Lacquer Mount Doom, I, A.M CustomColor DiamondPRO topcoat. 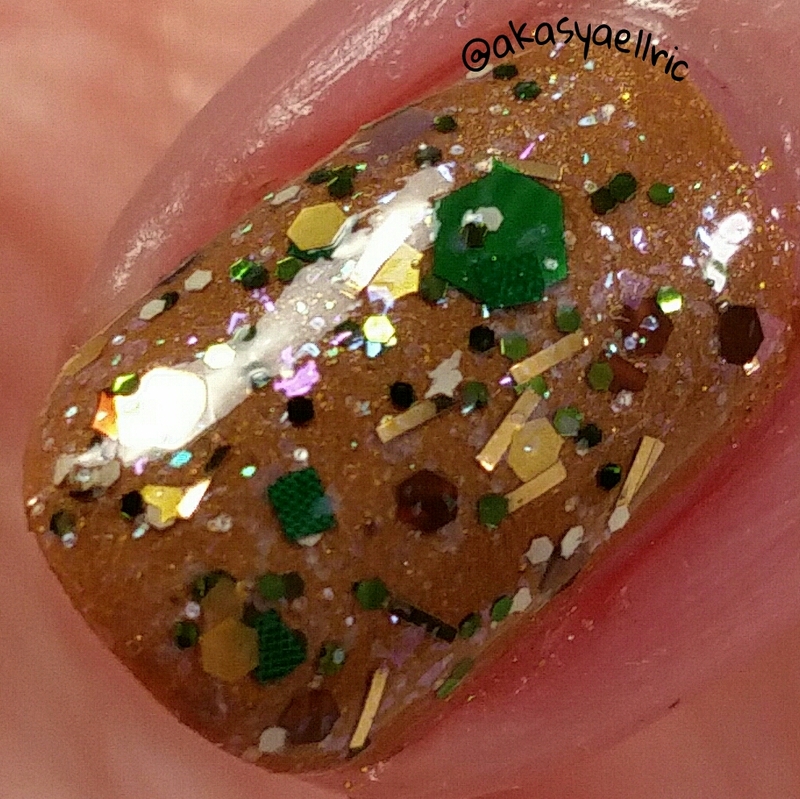 Sinful Colors Gold Medal used for stamping with Moyou London Geek 05. Rivendell is inspired by the beauty of the elven city it is named after. 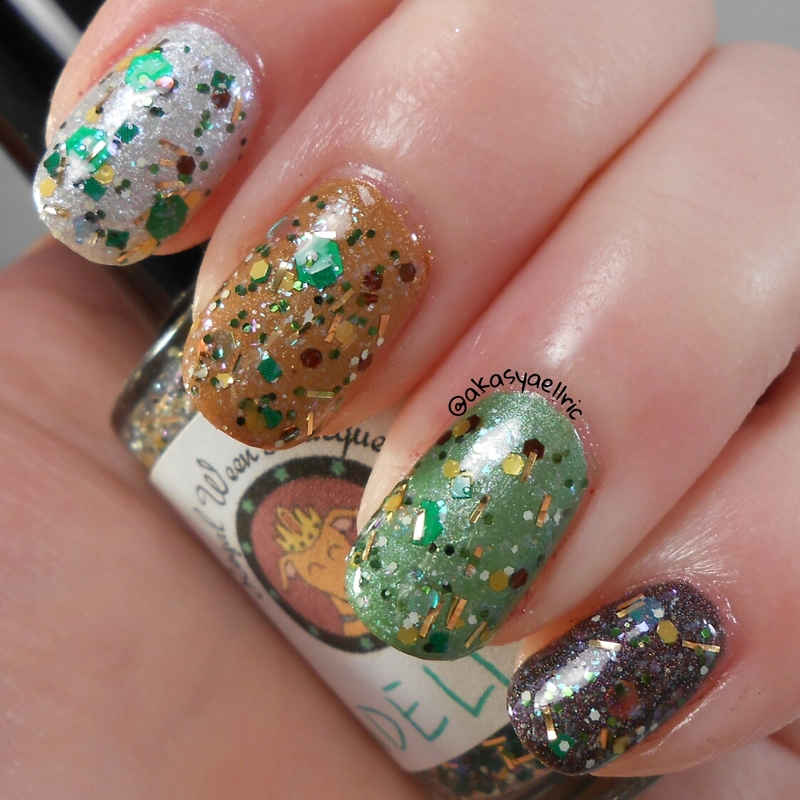 It has green, mint, gold, holo white, iridescent and brown glitters, as well as multicolored illusion flakes in a clear base. It can be used as a topper or layered to opacity. I did one to two coats on each color from the collection. 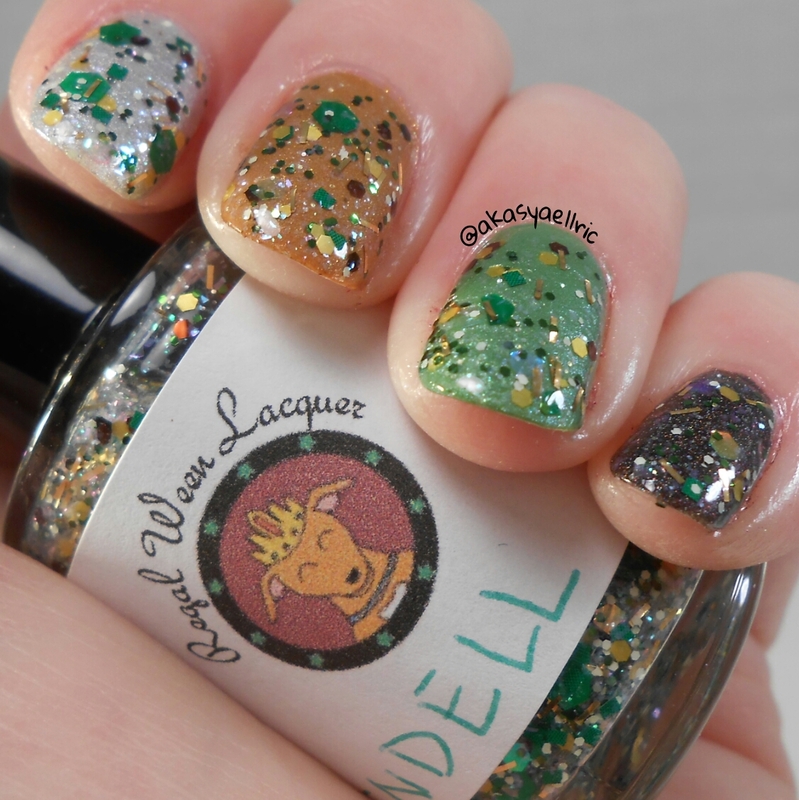 Regal Ween Lacquer has some of the best glitter toppers on the market, they are packed and you don’t have to fish for anything. Formula is great, fast dry time and no smudging. 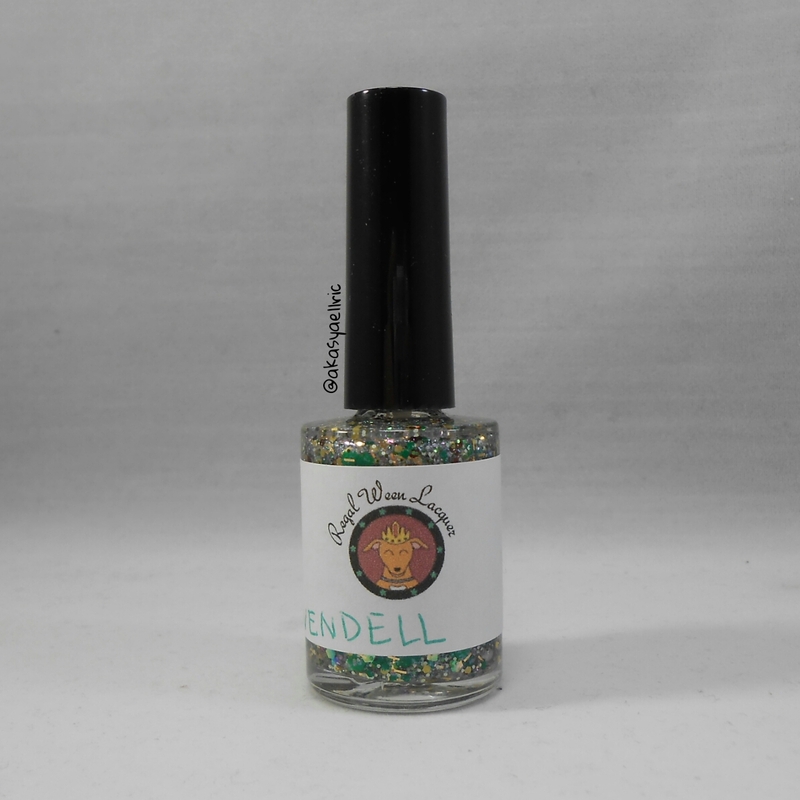 Products used: Dainty Digits Polish Glitter Be Gone basecoat, Regal Ween Lacquer Rivendell, I, A.M CustomColor DiamondPRO topcoat.